In the present era where a degree of B.tech. and MBBS are mostly encouraged by the society, the students rarely get to hear about some outstanding courses, one of which is B.Ed. Earlier known as B.T. (Bachelor of Training), B.Ed. stands for Bachelor of Education, which is an undergraduate academic course. 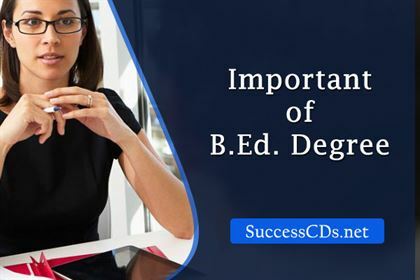 If you are thinking whether you should get a B.Ed. or not, you must take notice of the following details properly. This course is mainly for those who want to pursue a career in teaching. Especially to teach in higher primary and high schools, it is mandatory to have a ‘first’ degree of B.Ed. This course is of a duration of 2 years. The minimum eligibility criteria for B.Ed. is the completion of an undergraduate degree course in any discipline. National Council for Teacher Education (NCTE) is the panel which oversees the standards, procedures and processes in the education system of India. Graduation (B.Sc., B.Com, B.A) from any recognized University with minimum 50% score. Master’s Degree in Science/Social Sciences/Humanity/Commerce with minimum 50% marks will be eligible. Bachelor’s Degree in Engineering or Technology with specialization in Mathematics and Science with at least 55% marks or any equivalent qualification will also be eligible. Candidates have to appear the B.Ed. entrance test conducted by various states and institutions. The exam is usually conducted in the month of May or June and its form can be found in online mode only. The test is generally based on General English, Teaching Aptitude, General awareness and Logical and Analytical Reasoning. With education becoming an important factor responsible for the development of a country, it has become a sector for a huge number of jobs. From recent research data, it was found that there are approximately 1.3 million schools in India. Thus, there is a lot of scope in this sector. And to enter this sector, a B.Ed. degree is a must. Under the RTE Act, it has been made compulsory to have B.Ed. degree to become a teacher. It also helps in getting appointed as a teacher in both Government and public schools. This course helps one to learn the methodologies involved in the teaching profession. It consists of the training process that will make a person a very efficient teacher. The profession of teaching is a very attractive career as it demands huge respect from the society.India has always had a tradition of holding teachers in great regard. And it should never be ignored that apart from parents, teacher is the most crucial person in shaping the minds of young students. It is an undeniable fact that there are some great teachers behind every successful person. Apart from respect, there are various paths for career progression as a teacher.As a teacher, one’s salary can vary greatly depending on training, qualification, and the type of school one’s employed in. In such cases, having a B.Ed. can make a huge difference to the salary package. It is a very stable job which doesn’t involve risks. It also ensures job security and job satisfaction. Recently, approximately 1200 students from different IITs and NITs were employed to teach students in backward areas across 11 states and union territories. This shows that today it has become the need of the hour to increase the population of skilful teachers in our country.